The metal accessory parts are at least a month behind. The factory is making sure that they weed out and metal bells with visible flaws. At the price the sets will be going for, we want them to be flawless. Only a few people have seen them first hand. I actually don’t have a full set myself other than the one installed on our buildup. But everyone that has seen them will attest to how magnificent they look. Speaking of flaws… with as much energy as we put into the kit, nothing can be considered perfect. I’m going to be up front and fill you in on the handful of things to keep an eye out for if you are a discriminating modeler. One point the factory misinterpreted in their final clean up was the presence of two “teeth” on the trailing edge of the command module halves. The presence of them would allow the main pod shell to grip onto the back wall without the need for cement. Unfortunately these were removed on accident and are not present on the first production run of kits. This has already been corrected on the tooling so subsequent production runs will have this feature. During the tool polishing stage, the factory got a bit carried away on the port windshield part causing a bit of a wave in it which gives a bit of distortion when looking through it. The tool is being reworked to correct this as well. There are pins present on the back side of the CM sensor dishes. These pins are oriented at an incorrect angle. This will get fixed later on too. Two errors were present in the data we sent to the factory that was used to create the model. Correcting these problems was problematic as it would require substantial tool work for the very slightest amount of change. the first error is the depth of the RCS thruster housing. 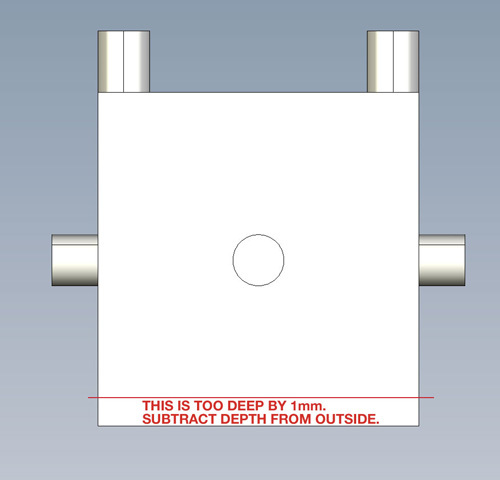 They are 1mm too deep. The second error was not noticed until just recently. The nozzles on the loose Gemini domes should have been either A) been fudged a bit so one part could be used in every application or B) had lefts and rights made on the tool. 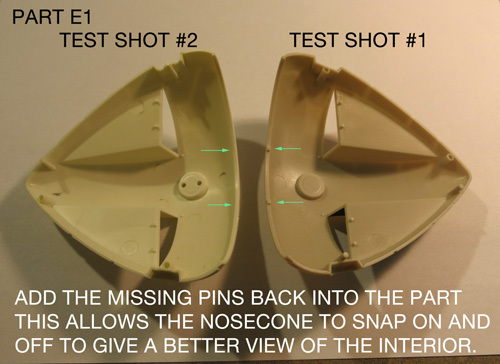 Sadly this wasn’t the case so now the “lean” (the angle is fairly slight) in the wrong direction in some cases. In the big scheme of things these are all very small things. But I figured I should stay as straight forward as I always try to be. I mentioned that we were making corrections where reasonably feasible on the problem areas I mentioned so the kit is more “right” when we do subsequent production runs. As of this writing we are very nearly sold through (that means from our warehouse, not necessarily at the retail level) on the first batch of Eagle kits. A second batch was already on order some time ago, but we don’t expect those kits to arrive until later this month. In fact, we’ve placed a third order to follow behind that one as sales have been very brisk. So, that means if you want yours soon, but you haven’t ordered one you should do it now or you may end up having to wait a bit until more fill the distribution lines. Further good news is that our friends over at Sci-Fi Fantasy Modeler have launched their digital publication program. Be sure to check them out to get some free digital content now, while new stuff like the Eagle special will be coming soon. I also understand they will be making back issues available digitally as well. So check them out and keep an eye out for more from them. Read the yellow section at this link to find out more details. Not to introduce brand confusion (read the title closely) we got word this morning of a new sci-fi oriented website that looks pretty promising so far. Check out the link below and look for the 1:350 scale U.S.S. Constellation article. Looks pretty great. While I’m talking up websites/forums/online modeler gatherings I wanted to mention a fan group on Facebook that has been very supportive of the Eagle kit. If you aren’t already a member, do a Facebook search for “Space: 1999 Props & Ships” to see what Todd Morton and a ton of other kind S:1999 fans from all over the world are talking about. Lastly, we know a lot of people have been asking why our own model kit website hasn’t been updated recently. Fear not. Attention has turned to developing an all-new website that will host all of Round 2’s product lines. It is a complicated endeavor that a limited few of our staff have been handling for several months. There is still a lot of work, redirecting and updating to do before we start using it. Round2models.com as you know it will stay active until everything is up and running on the new site. This entry was posted on Tuesday, January 12th, 2016 at 11:20 am	and is filed under Round2 Models. You can follow any responses to this entry through the RSS 2.0 feed. You can skip to the end and leave a response. Pinging is currently not allowed. Will the supplement kit whith the metal parts always be available or are they a short run when they are released? I would like to get them, but I may have to wait a little bit to save for them. If they are a limited run, I will need to adjust my budget a bit. That’s a bit of a loaded question. Basically, we are currently limited by what we’ve run for the first order. If we sell out quickly, we’ll order more. If they move slowly, they may never be run again and when they are gone they will be gone. This is one of those grail kits, and I’m so glad it is finally here and brought to us fans and modelers with such obvious care! Thank you so very much! Question…will there be any way of telling on the box whether the kit is from the first, second, or third production runs? Aside from those minor issues, though, the kit looks fantastic! Thanks again! Not really a way to tell on the box. If you wait to buy for a couple months you’ll likely end up with a kit from a later run depending on your retailer. I’m looking forward to my kit. These “errors” seem really minor and can be worked around with the exception of the windshield. Will you be offering the “corrected” windshield to replace the flawed ones in the first run? No. It was considered a minor problem that the greater majority of modelers won’t be terribly concerned about. So, do I read this correctly? R2 has ordered 3 runs of the Eagle already? If so its nice to see it selling so well! 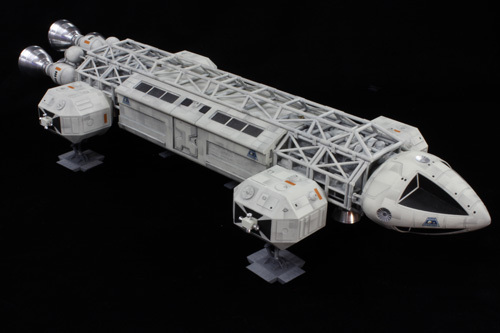 I hope this helps the possibility of more Space 1999 kits in the future! Hawk, Stun gun, Comlock, Laser tank? Initial sales have been brisk (and that is GREAT! ), and we have plans for more kits over time, but consistent long term sales are what we always hope for. I’ll do my part and buy another 1 or 2 eagles. Any thought to picking up the UFO license? Maybe once we’ve burned through all of our Space:1999 ideas. Those issues seem minor. The window, if it’s flat plastic (hard to tell for sure in the image) can be fixed in a minute by almost any modeler. I already have one of the kits on the way and I’m looking forward to it. I’m pretty sure I’ll get at least another one on order soon to try and max out after I build the first one. I received two of this fabulous kits today (I have another one on order). I am really pleased to see that there will be at least another run due to ‘brisk’ sales. It would be great if there was better distribution in Europe (especially the UK) as I had to order the first two from the US (and hope I didn’t get a hefty customs charge). I also hope that you get the extra mile and produce the additional pods and booster that fans will be asking for..!! Once again – great work. I’ve received my first two. Round 2 has done an amazing job. Thanks so much. It’s still kind of hard to believe that anyone could make this happen 40 years after a show remembered by not that many people. I hope the brisk sales continue. I picked up my first two today. This kit is gorgeous! Two more to come makes four, and the beautiful aluminum add-on packs make this one of the best modelling years for me! Great news all around! I’ve seen a couple video reviews now and the kit looks great. Lots of plastic crammed into the box, great art work on the outside, excellent attention to production process and details along with ‘brisk’ sales! Fantastic to hear. Also great to hear that you have more ideas to burn through on this series! Lastly, was wondering about the lack of 2016 updates, good to hear on the new improved round 2 website. Congrats on a great launch and thanks to all at R2 for taking the chance! I’m glad it seems to be paying off so far. – small scale Ultra probe, Gwent, Swift, pretty much anything Martin Bower built for the show! All have been considered. Way you early to tell which way we might go. Will we see an update on the Excelsior?? test shots should arrive next week. Jaimie, Thanks to everyone at Round 2 for this kit—I have wanted a large scale Eagle since the 70s! Q: How difficult will it be to replace the windshields with clear styrene or acetate? I couldn’t say for sure. It depends on the modeler’s skill level. Rumor has it that Round 2 will be re-releasing the Klingon Bird of Prey kit (with landing gear) sometime in February. Any idea when we can expect to see these hit store shelves? It is indeed coming, but it got bumped back a bit. Look for it sometime in March or April. My next holy grail kit would be the Galileo, Anything new on that kit? Thanks very much for putting so much effort into getting the these kit correct. FANTASTIC! Have my Eagle ready for painting and am working on shimming in a cockpit and pod interior! A fantastic idea,(I think)would be to make “separate” Pod Kits. Lab Pod, Generic Pod etc. By the way…how IS the Star Trek TOS Shuttlecraft coming? The 22 inch Eagle kit is great. I never dreamed Round 2 would do a new Eagle kit. I was almost excited about this model as I was the 1/350th TOS Enterprise. That one was my grail kit. Hopefully there will be more 1999 kits in the future. Heck, I wouldn’t mind seeing kits from other Gerry Anderson shows. Take a bow Round 2! This is a Great kit.